Dozens of art museums and hundreds of art galleries are sprawled all across Los Angeles. Sometimes I wonder how much time it would take to see them all. A week? A month? 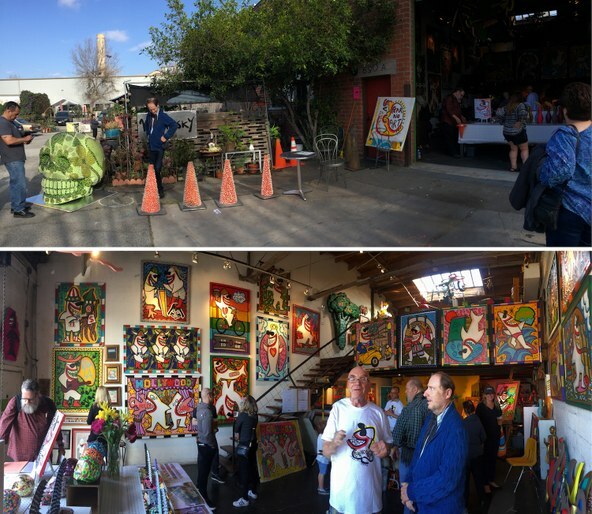 Last weekend, along with a crowd of several hundred people, I did my best to catch a glimpse of what’s cooking behind closed doors at the famous Brewery Arts Complex in Downtown L.A.
Top: Last weekend’s Spring Brewery Art Walk. Bottom: A glimpse into one of the hundreds of artists’ studio-homes. Photos by Edward Goldman. Located less-than- a-mile east of Union Station, the Brewery covers 23-acres consisting of 14 buildings, among them, the historic Edison Electric Steam Power Plant built in 1903. Later, the complex became home to Pabst Blue Ribbon brewery, but in the early 80s, it grew into one of the largest artist colonies in the world, with hundreds of studios inside. 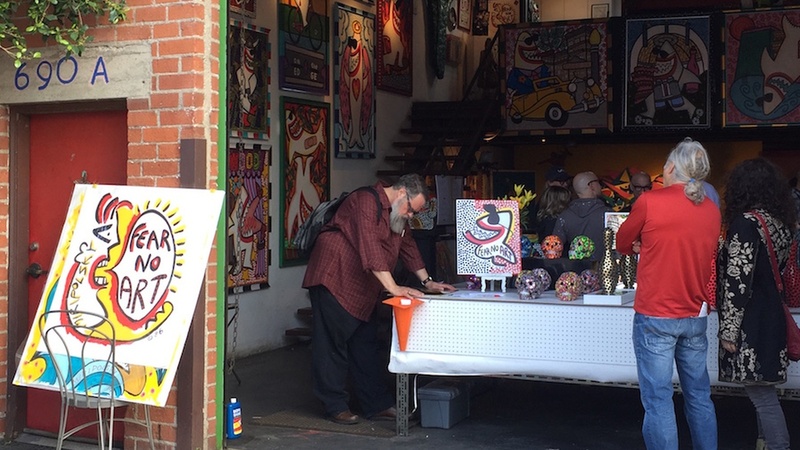 Last weekend, the Brewery had one of its annual Art Walks, which happens every six months. 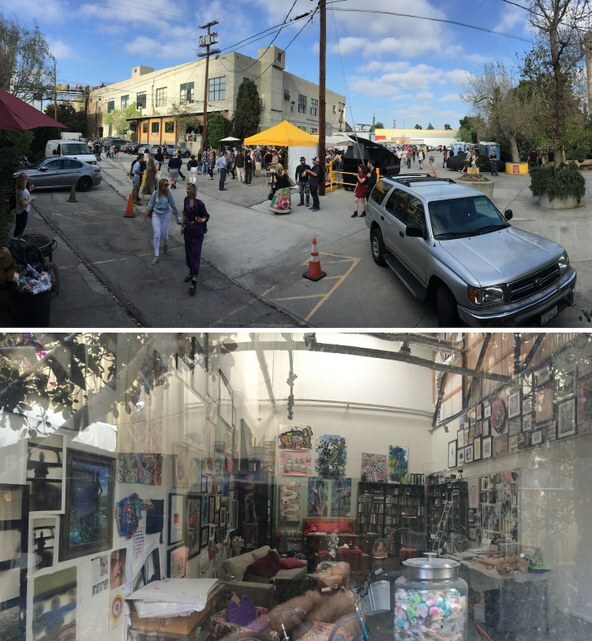 Outside and inside Andre Miripolsky’s "Fear No Art" studio. Photos by Edward Goldman. 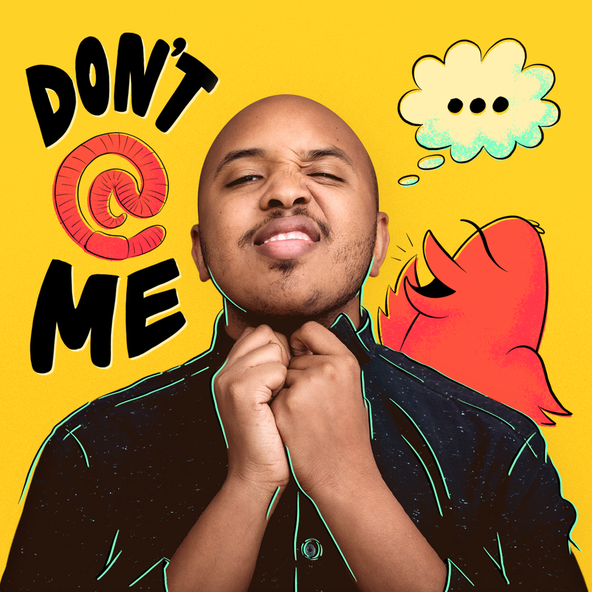 If you’ve never been to an artist’s studio, the Brewery Art Walk is a unique chance to do this and get drunk on good, bad, and “whatever” art. And I mean it both figuratively and literally— True to theme, alcohol is served everywhere. With hundreds of people around, you feel free to step in and out of any studio without introducing yourself. If you like the art, you stay and ask questions. If you don’t, just turn around and leave—There are no hard feelings. Left: A former steel fabrication plant, Paradox Iron. Right: The Stronghold Climbing Gym at the Brewery. Photos by Edward Goldman. And for the most adventurous among us, there is even a chance to get “high” at the Brewery—and yes, I mean it literally. 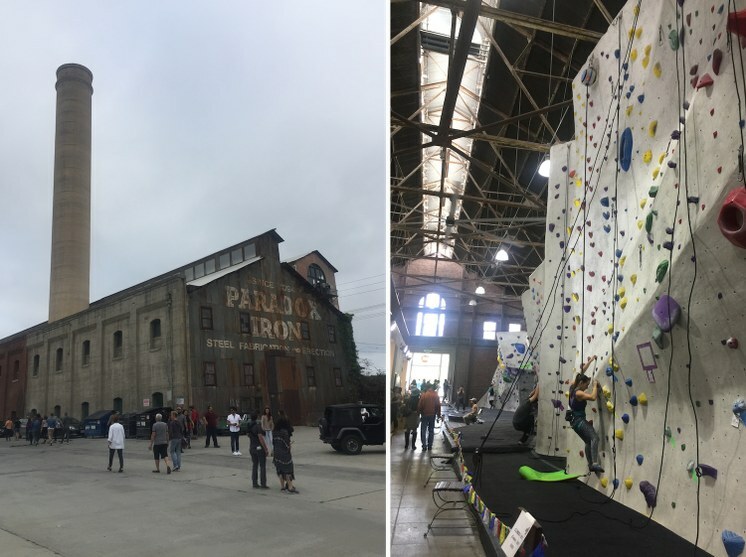 There is a climbing gym inside the Edison Power Plant with a 46-foot rock wall, which looks like a gigantic, abstract sculpture-painting. I wonder how many shots of vodka it would take to persuade me to climb this wall. Installation view, Sol LeWitt, 2018. Honor Fraser Gallery, Los Angeles, CA. Photo by Brian Forrest. Image courtesy Honor Fraser Gallery. After drunken happiness at the Brewery, here is an example of art as a mix of mathematical perfection and poetry. Across town in Culver City at Honor Fraser Gallery, there is a mini-retrospective of works by major American artist Sol LeWitt (1928-2007). The way poets use the meter as a rhythm, Sol LeWitt uses the cube as a unit in amazingly rich, geometric language of his art. This must-see exhibition runs through May 12. 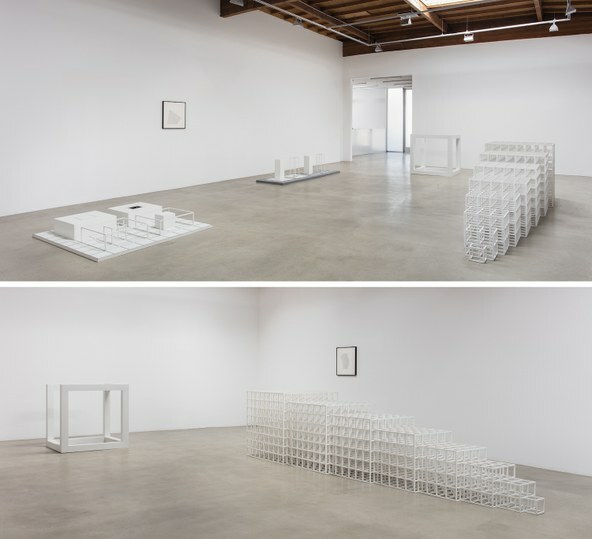 Robert Irwin Installation view, Sprüth Magers, Los Angeles, January 23 - April 21, 2018 Courtesy the artist and Sprüth Magers Photo: Robert Wedemeyer. 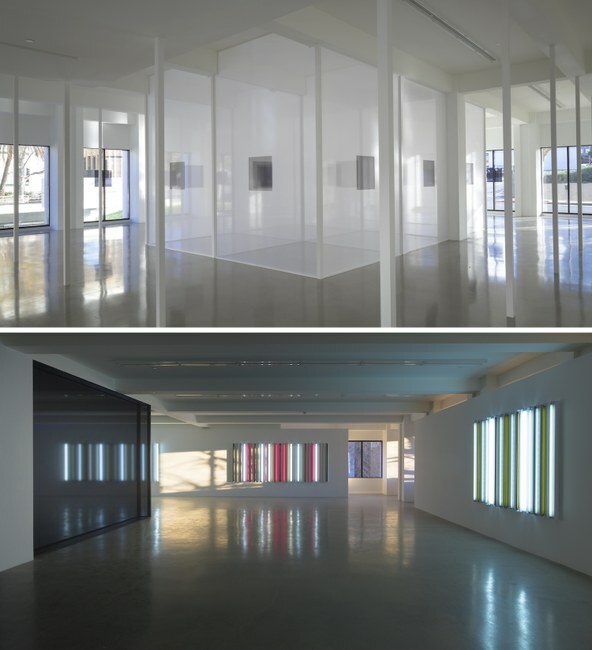 And the Robert Irwin show at Sprüth Magers Gallery, across from LACMA, is another must-see exhibition, which mysteriously manipulates our perception of light and space. On the ground level, with its 5,000 square-foot exhibition space, there is nothing but light coming from the windows and streaming through a series of semi-transparent white scrims. Miraculously and seemingly effortlessly, the whole space is transformed into a meditative, artistic temple. On the gallery’s second floor, Robert Irwin switches from minimalism to dramatic use of color with the help of brightly lit neon tubes arranged on the walls in vertical rows. If you want to experience the quiet happiness of this exhibition, be sure to do it before it closes next week on April 21.